Our church started a few years back in a banquet hall! It was small and consisted of 12 people. The church has had a very strong youth outreach. Using cool music, small Christian rock concerts, Sunday school, and youth group as a tool to instill the word in the hearts and minds of the youth. The Church was blessed with a storefront on Main Street in Kendallville, Indiana. From the storefront God blessed it to grow, as a result of strong biblically focused teaching in an at-home family-style environment. 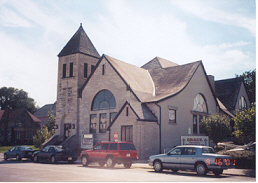 The church is currently at 126 E. Mitchell Street in Kendallville, Indiana. Our goal remains the same. We want to impact our world and community through the power of God, missions, bible teaching, and youth and community outreach. We give all credit, praise, glory, and honor to Jesus Christ.